China keeps inching further ahead of the U.S. in the clean energy development race, first with a multi-billion dollar investment in electric cars and hybrids, and now with news that the country has completed its first offshore wind farm. The U.S. has yet to complete one. The 102-megawatt Donghai Bridge Wind Farm, located 5 to 8 miles off the coast of the East China Sea, features 34 turbines with 3 megawatts of capacity each. The $337 million turbine project is attached to the soft seabed with legs installed on top of concrete piles, which are in turn covered by a concrete tack and the turbines. 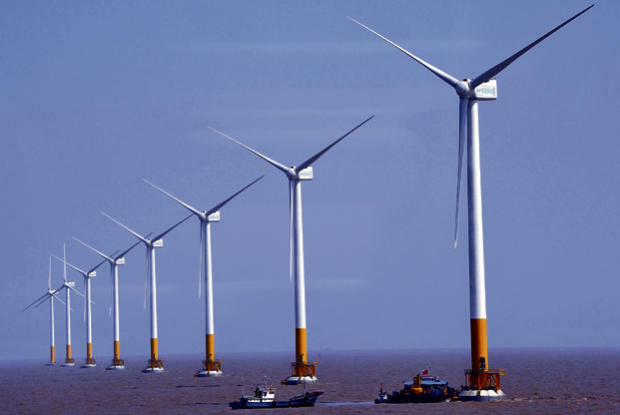 As it stands, the wind farm produces just 1% of Shanghai’s 18,200 MW total power production. But by 2020, China hopes to have 30 gigawatts of offshore wind power, according to the New York Times. And the U.S.? It’s still lagging far behind. The Cape Wind offshore turbine project, planned for Nantucket Sound in Massachusetts, has federal approval, but there is still regulatory opposition to deal with. For some perspective, the Cape Wind project is entering its 10th year of negotiations–China’s offshore project was approved and completed in just four years. Which means that the U.S. won’t catch up to China anytime soon.